Showing items in category Turks and Caicos Islands, sorted by newest listed first. TURKS AND CAICOS ISLANDS - 1917 1/- rate registered cover to USA. 1917 (FE.10.) 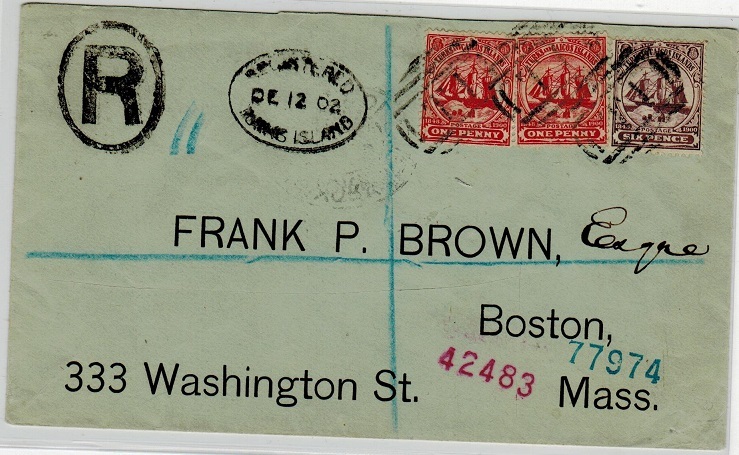 registered cover to USA bearing the 1/- brown-orange (SG 137) tied by TURKS ISLANDS cds. TURKS AND CAICOS IS - 1944 'PASSED/ D/43' censor cover to USA. 1944 (JY.25.) cover addressed to USA bearing 'Coronation' 1/2d, 2d (x2) and 3d (x4) all on the reverse side and tied by GRAND TURK cds's with black octagonal crowned PASSED / D/43 censor mark on front. Complete with the original letter. 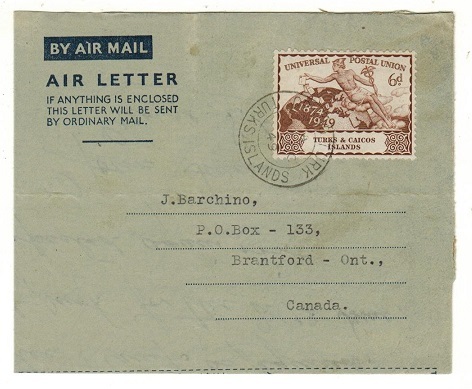 TURKS AND CAICOS IS - 1949 6d 'UPU' use of FORMULA air letter genuinely used to Canada. 1949 (3.OC.) use of dark blue on greyish FORMULA air letter addressed to Canada (genuine use) bearing 6d UPU adhesive tied GRAND TURKS/TURKS ISLAND cds. A nice use. TURKS AND CAICOS IS - 1932 5 1/2d rate registered cover to UK used at SALT CAY. 1932 (SP.30.) 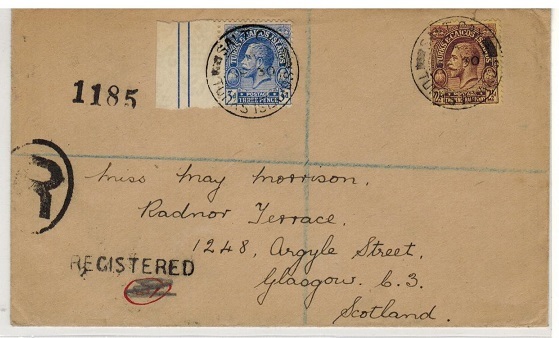 registered cover addressed to Scotland bearing 2 1/2d and 3d adhesives each tied by SALT CAY/TURKS ISLAND cds's. Oval 'R' in black and scarcer REGISTERED s/l handstamp below. TURKS AND CAICOS IS - 1926 local registered cover used at SALT CAY. 1926 (AU.16.) 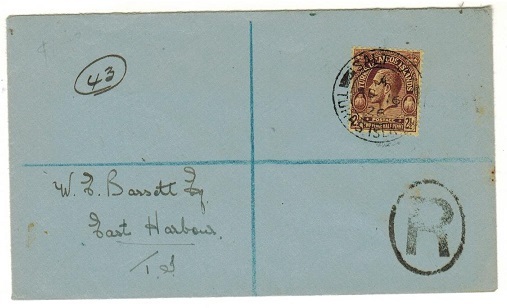 locally registered cover addressed to East Harbour bearing 2 1/2d adhesive tied by SALT CAY/TURKS ISLAND cds. Oval 'R' h/s below. A nice registered internal use from Salt Cay. TURKS AND CAICOS IS - 1899 2d blue RPSE unused SPECIMEN. H&G 1a. 1899 2d blue on cream registered postal stationery envelope (size G) in fine unused condition with SPECIMEN applied diagonally in black on reverse. H&G 1a. 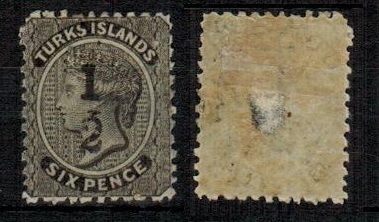 TURKS AND CAICOS IS - 1881 1/2 on 6d black mint with SHORT BAR. SG 8. 1881 1/2 on 6d black in mint condition with original gum (small adherence from page mounting) of the second setting and showing SHORT BAR. SG 8. 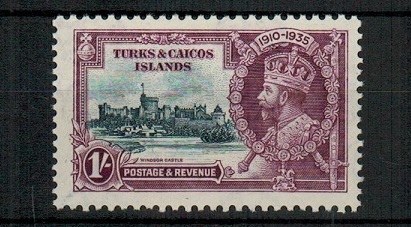 TURKS AND CAICOS IS - 1935 1/- 'Silver Jubilee' mint with LOG AND KITE variety. SG 190k. 1935 1/- slate and purple 'Silver Jubilee' adhesive in fine mint condition showing the LOG AND KITE variety. Row 10/6 plate 2A. SG 190k. TURKS AND CAICOS IS - 1917 1d red 'War Tax' mint with DOUBLE OVERPRINT. SG 140a. 1917 1d red 'War Tax' adhesive in fine mint condition (overall light toned gum)showing the major variety OVERPRINT DOUBLE. SG 140a. TURKS AND CAICOS IS - 1903 2 1/2d rate cover to USA. 1903 (MY.13.) 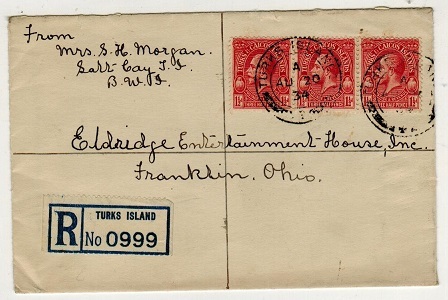 cover addressed to USA bearing 1/2d and 1d (x2) tied TURKS ISLANDS. TURKS AND CAICOS IS - 1919 3d 'War Tax' U/M block of 12 with INVERTED WATERMARK. SG 153y. 1919 3d Purple on orange buff 'War Tax' adhesive in a superb unmounted mint marginal block of 12 showing the variety WATERMARK INVERTED AND REVERSED. A scarce multiple. BK G24d. SG 153y. TURKS AND CAICOS IS - 1928 4/- rate registered cover to UK. 1928 (AU.7.) 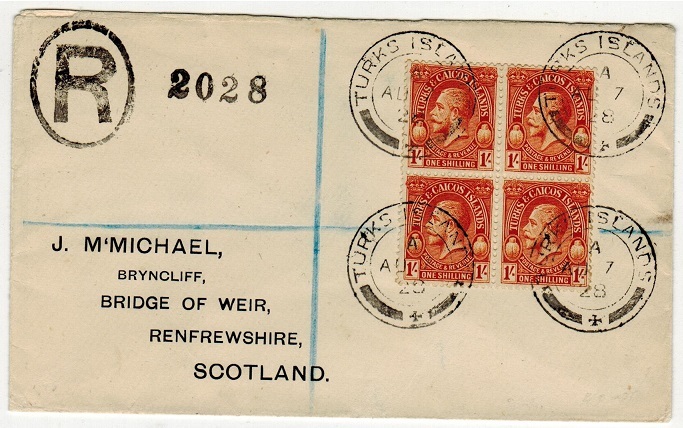 registered (Michael) cover addressed to Scotland bearing a fine block of four of the 1/- adhesive (SG 183) tied by TURKS ISLAND cds's with oval 'R' marking at left. A scarce use of this 1/- multiple. 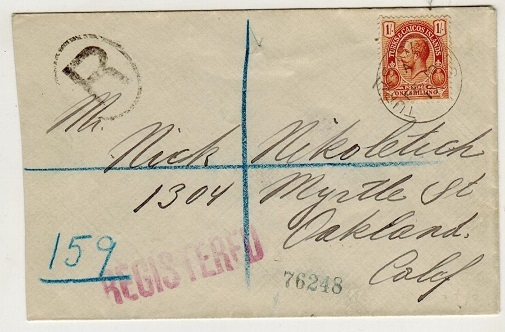 TURKS AND CAICOS IS - 1896 6d rate registered cover to USA. 1896 (JU.18) reg'd cover to USA bearing 6d (SG 59) tied by 'T1' duplex with oval REGISTERED /TURKS ISLANDS cancel alongside. 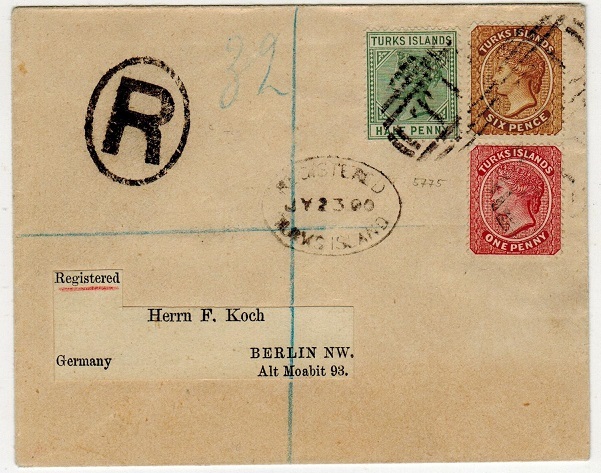 1900 (JY.23) registered cover to Germany bearing 1d & 6d adhesives (SG 59+64) tied in combination with the 1/2d 'key plate' (SG 53a) by 'T1' duplex's with oval REGISTERED/TURKS ISLAND cancel alongside. TURKS AND CAICOS IS - 1902 8d rate registered cover to USA used at TURKS ISLAND. 1902 (DE.12.) 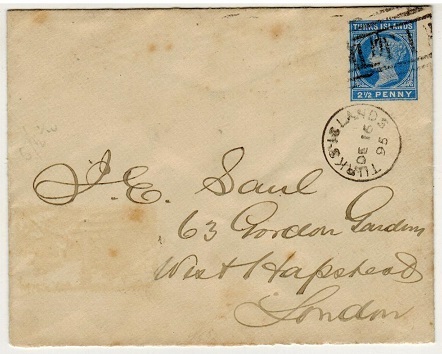 registered cover addressed to USA bearing 1d (SG 102) pair and 6d (SG 106) tied by 'T 1' duplex's with oval REGISTERED/TURKS ISLANDS cancel alongside. TURKS AND CAICOS IS - 1893 1d red PSC to USA used at TURKS ISLANDS. H&G 5. 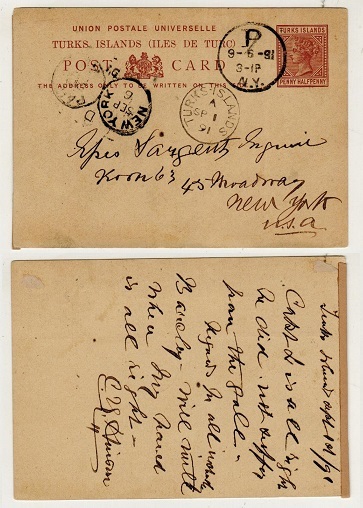 1893 1d carmine on buff postal stationery postcard addressed to USA cancelled by TURKS ISLAND cds dated JY.27.95. NEW YORK/PAID/A/ALL strike applied in transit. A scarce genuine use. H&G 5. TURKS AND CAICOS IS - 1895 2 1/2d blue PSE unused SPECIMEN. H&G 1a. 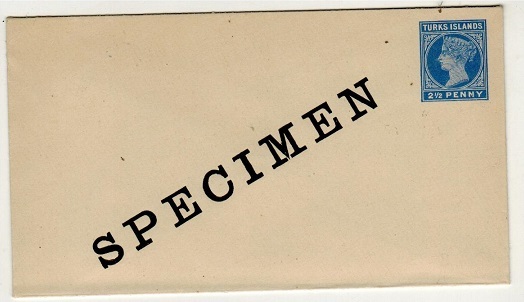 1895 2 1/2d blue on cream postal stationery envelope (size b) in fine unused condition overprinted SPECIMEN diagonally. H&G 1a. 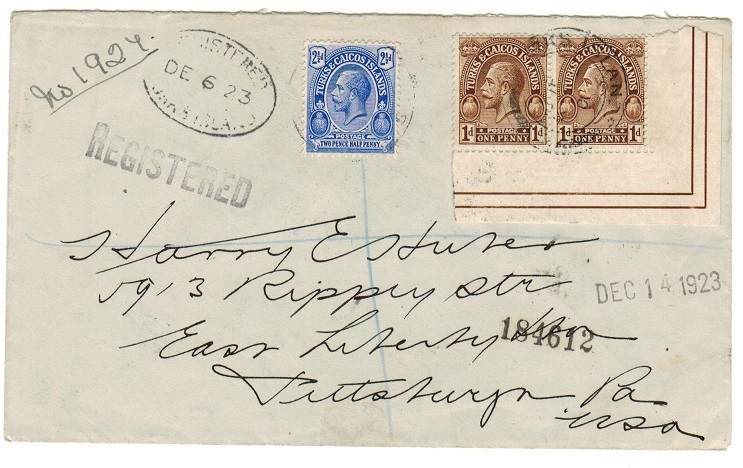 TURKS AND CAICOS IS - 1895 2 1/2d blue PSE addressed to Jamaica used at TURKS ISLANDS. H&G 1a. 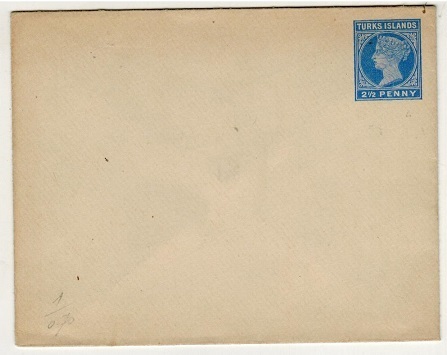 1895 2 1/2d blue on cream postal stationery envelope (size b) addressed to Jamaica cancelled by 'T 1' duplex with TURKS ISLAND cds alongside dated AU.23.95. A nice inter-island use. H&G 1a. TURKS AND CAICOS IS - 1895 2 1/2d blue PSE unused. H&G 1a. 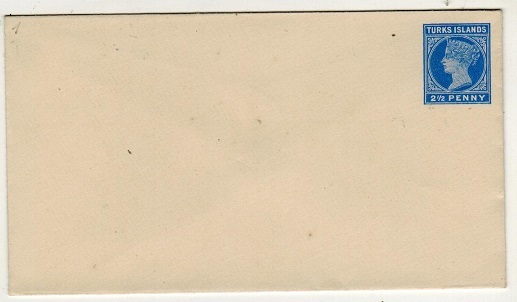 1895 2 1/2d Blue on cream postal stationery envelope (type b). Fine unused. H&G 1a. TURKS AND CAICOS IS - 1895 2 1/2d blue PSE to UK used at TURKS ISLANDS. H&G 1. 1895 2 1/2d blue on cream laid paper postal stationery envelope (type a) addressed to UK & cancelled by 'T1' duplex with TURKS ISLANDS cds alongside dated DE.16.95. H&G 1. 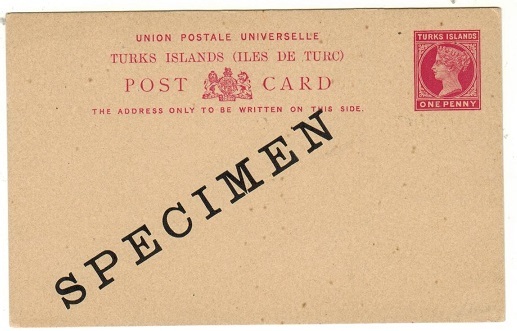 TURKS AND CAICOS IS - 1895 2 1/2d blue PSE unused. H&G 1. 1895 2 1/2d Blue on cream postal stationery envelope (type a) in fine unused condition. H&G 1. TURKS AND CAICOS IS - 1881 1 1/2d+1 1/2d reddish brown PSRC unused. H&G 2a. 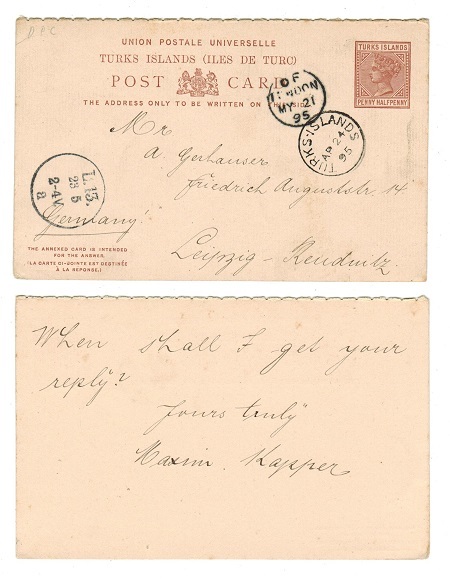 1881-85 1 1/2d + 1 1/2d Brown on cream postal stationery reply type postcard (perf 7) in fine unused condition. H&G 2a. TURKS AND CAICOS IS - 1881 1 1/2d reddish brown PSC to USA used at TURKS ISLANDS. H&G 1. 1881-85 1 1/2d reddish brown on buff postal stationery p'card addressed to USA cancelled by s/r TURKS ISLANDS cds dated SP.1.91. H&G 1. 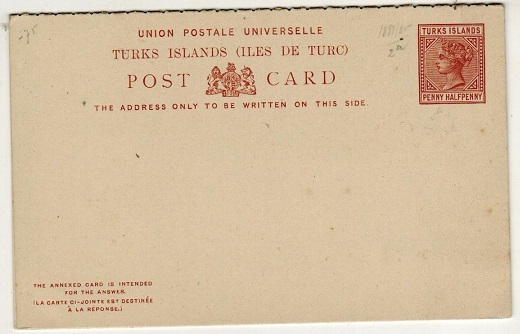 TURKS AND CAICOS IS - 1881 1 1/2d reddish brown PSC unused. H&G 1. 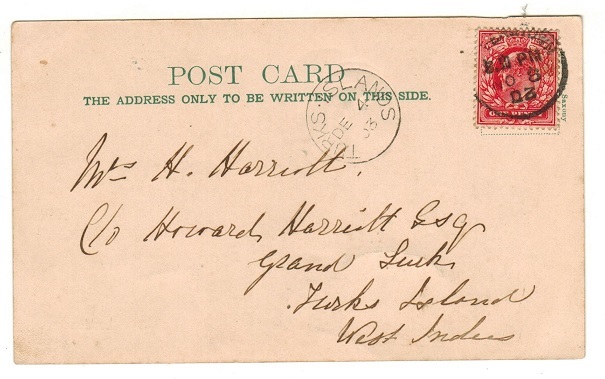 1881 1 1/2d reddish brown on buff postal stationery postcard in fine unused condition. H&G 1. TURKS AND CAICOS IS - 1893 1d carmine unused PSC overprinted SPECIMEN. H&G 5. 1893 1d carmine on buff postal stationery postcard in unused condition with SPECIMEN applied diagonally in black. H&G 5. TURKS AND CAICOS IS - 1897 multi franked cover to Germany. 1897 (FE.2.) 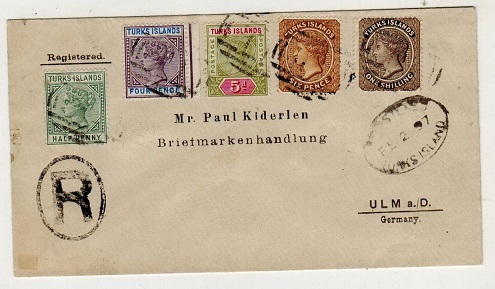 registered (Kiderlen) cover addressed to Germany bearing 6d and 1/- (SG 59+60) tied in combination with 'Key Plate' 1/2d and 4d (SG 70+71) and 5d (SG 72) by 'T I' duplex's with oval REGISTERED/TURKS ISLAND cancel below. 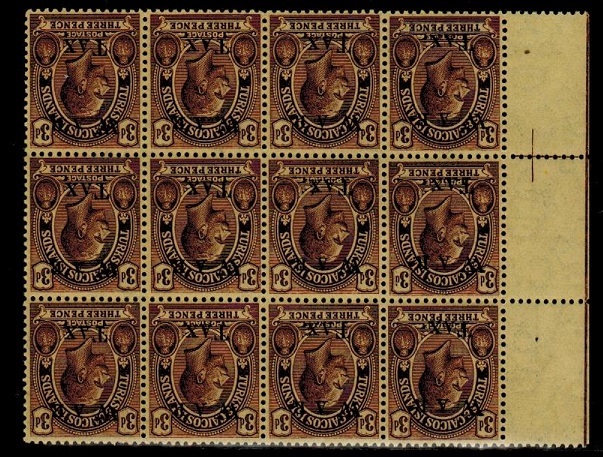 A colourful array of scarce stamps on cover. TURKS AND CAICOS IS - 1934 4 1/2d rate registered cover to USA. 1934 (AU.20.) 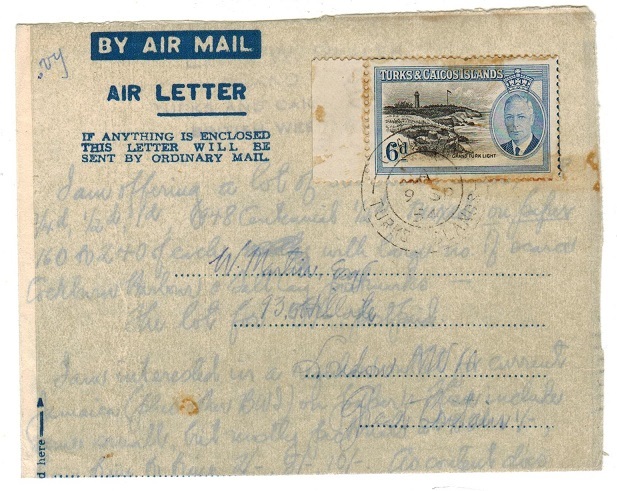 registered cover addressed to USA written in Salt Cay and bearing 1 1/2d strip of three tied by TURKS ISLANDS cds with code 'A' slug. Blue on white R/TURKS ISLAND/No.label at lower left. 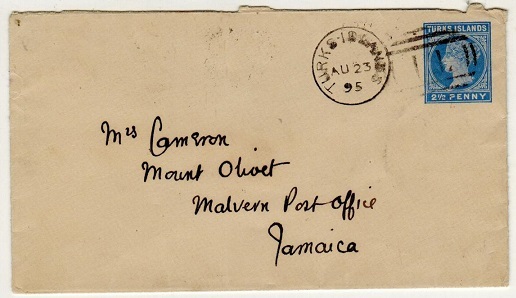 TURKS AND CAICOS IS - 1931 3d rate registered OHMS cover to USA. 1931 (AP.4.) 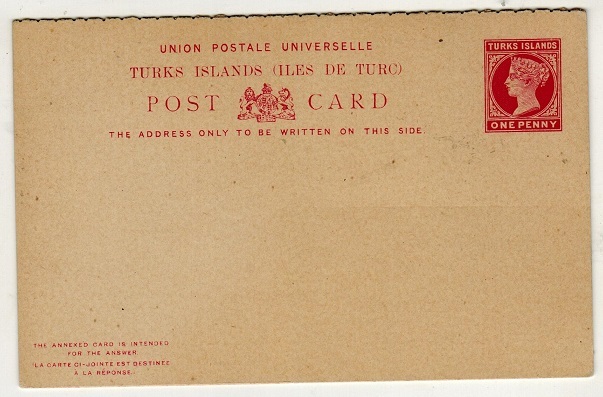 registered use of OHMS envelope addressed to USA bearing 3d adhesive tied TURKS ISLANDS. TURKS AND CAICOS IS - 1893 1d + 1d carmine on buff PSRC unused. H&G 6. 1893 1d + 1d carmine on buff postal stationery reply postcard in fine unused condition. H&G 6. TURKS AND CAICOS IS - 1892 1d on 1 1/2d provisional PSC unused. H&G 3. 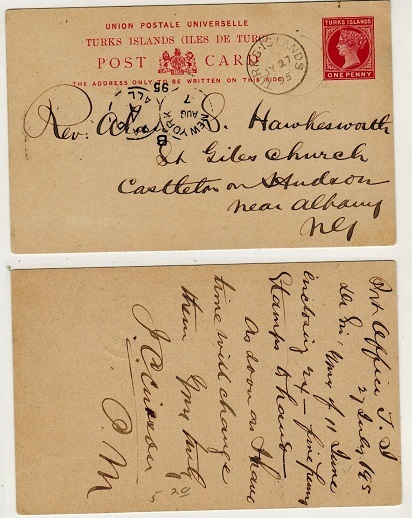 1892 1d black on 1 1/2d reddish brown on buff provisional postal stationery postcard in fine unused condition. H&G 3. TURKS AND CAICOS IS - 1920 2d dark blue RPSE unused. H&G 1a. 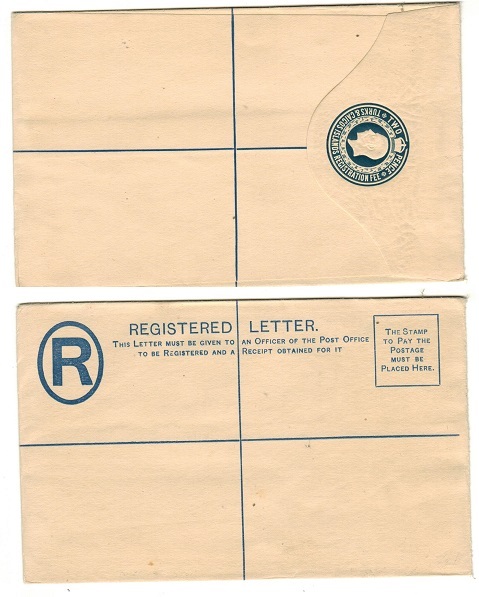 1920 2d dark blue on cream registered postal stationery envelope (size G) in fine unused condition with 'Thos De. La Rue & Co' imprint under flap. H&G 1a. 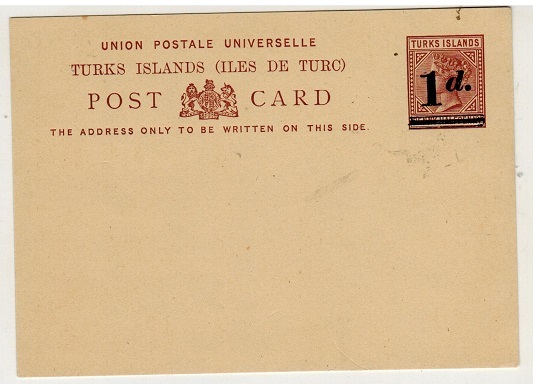 TURKS AND CAICOS IS - 1896 inward cover from UK with TURKS ISLAND arrival cds. 1896 (OC.18.) 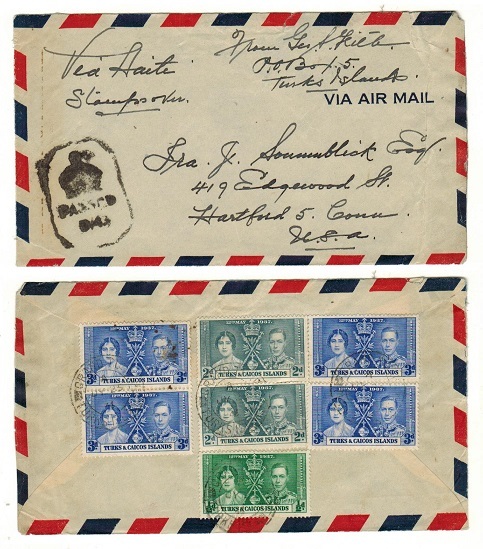 Inward cover from UK (opened on two sides) addressed to Grand Turk and with s/r TURKS ISLANDS arrival cds applied to the front. A scarce piece of inward mail. 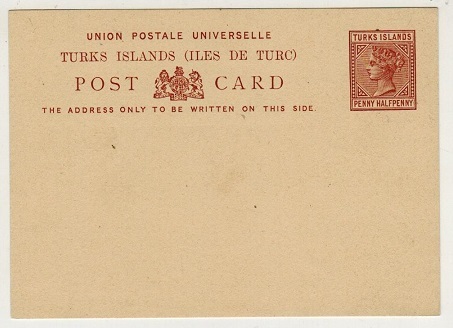 TURKS AND CAICOS IS - 1903 inward postcard from UK with TURKS ISLAND cds arrival applied. 1903 inward picture postcard from UK with fine s/r TURKS ISLANDS arrival cds dated DE.4.03. TURKS AND CAICOS IS - 1920 2d dark blue RPSE (size H) unused. H&G 1b. 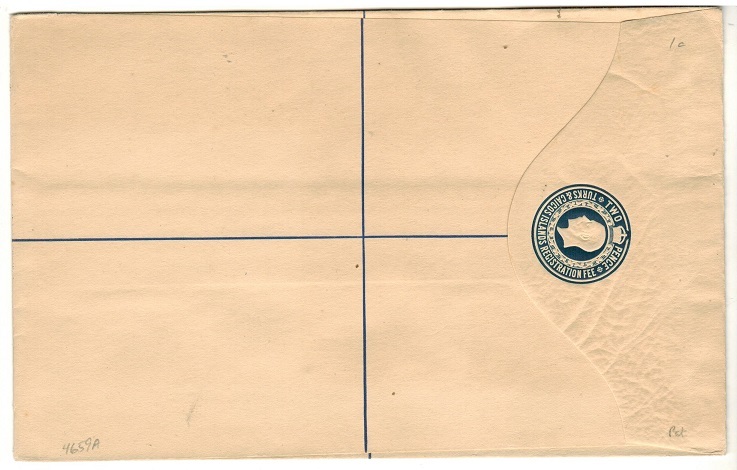 1920 2d dark blue on cream registered postal stationery envelope (size H) in fine unused condition. H&G 1b. TURKS AND CAICOS IS - 1923 4 1/2d rate registered cover to USA. 1923 (DE.6.) 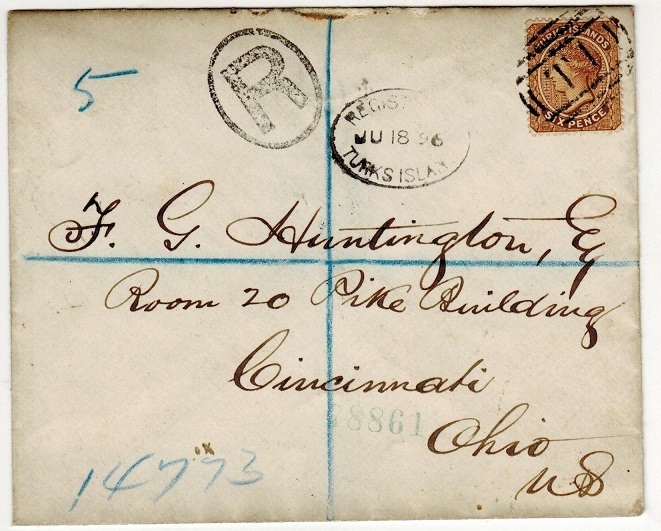 registered cover to USA bearing 1d pair and 2 1/2d adhesives tied TURKS ISLAND with oval REGISTERED/TURKS ISLAND strike at left. 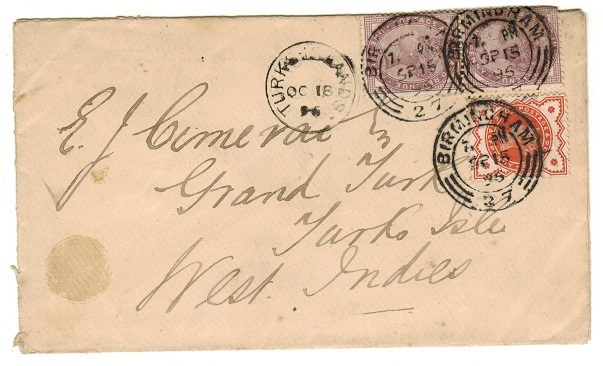 TURKS AND CAICOS IS - 1881 outward reply section of the 1 1/2d PSRC used to Germany. H&G 2. 1881-85 outward section of the 1 1/2d + 1 1/2d brown on cream postal stationery reply p'card addressed to Germany (genuine use) cancelled by TURKS ISLANDS cds dated AP.24.95. Scarce. H&G 2. TURKS AND CAICOS IS - 1905 1d rate cover to Canada used at TURKS ISLANDS. 1905 (NO.26.) 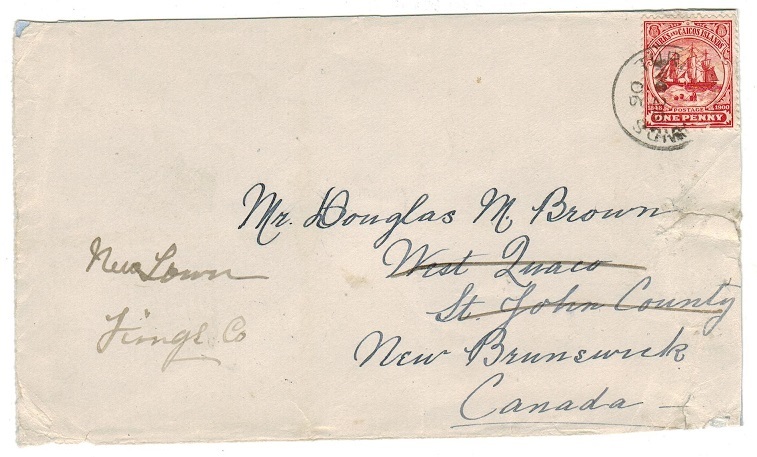 cover addressed to Canada (opened on two sides and with minor faults at edge) bearing 1d adhesive tied TURKS ISLANDS. 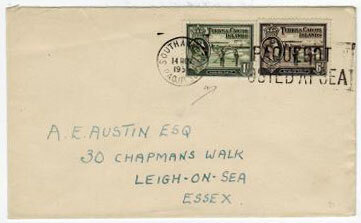 TURKS AND CAICOS IS - 1949 'Wedding' registered cover to UK used at COCKBURN HARBOUR. 1949 (MY.10.) 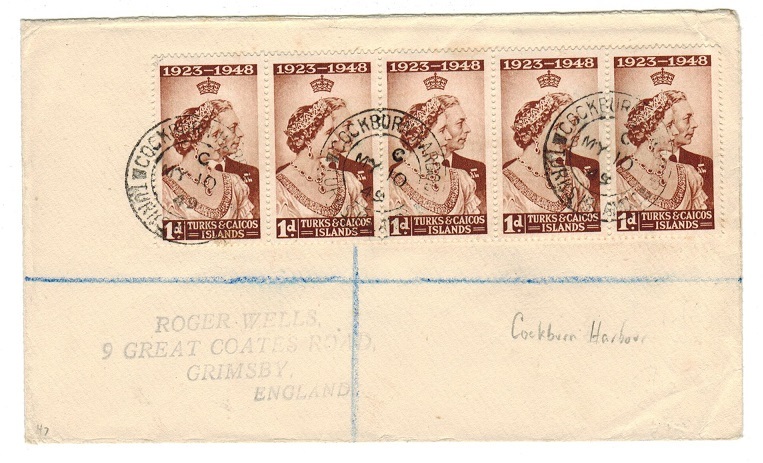 registered (Wells) cover addressed to UK bearing 1d 'Wedding' strip of five tied by COCKBURN ISLAND/TURKS CAICOS ISLANDS. 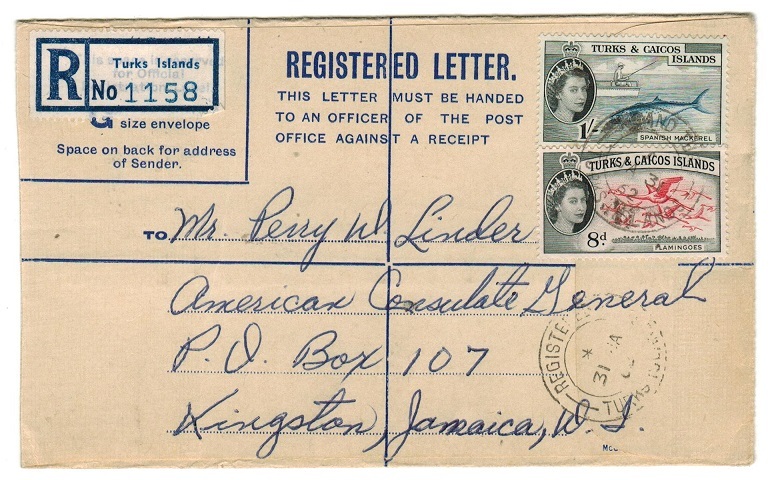 TURKS AND CAICOS IS - 1954 use of scarce 'local' produced air letter to UK. 1954 (SP.9.) scarce use of locally produced FORMULA type dark blue on greyish AIR LETTER addressed to UK and bearing KGVI 6d tied GRAND TURK/TURKS ISLAND d/r cds. Genuine use with message regarding postage stamps and with NASSAU/BAHAMAS transit b/s. TURKS AND CAICOS IS - 1947 OHMS registered cover to UK with OFFICIAL PAID cancel. 1947 (MY.27.) long stampless registered O.H.M.S. envelope to UK cancelled by TURKS & CAICOS ISLANDS/OFFICIAL PAID h/s in black. TURKS AND CAICOS IS - 1935 registered cover to Switzerland with 1/- 'Silver Jubilee'. 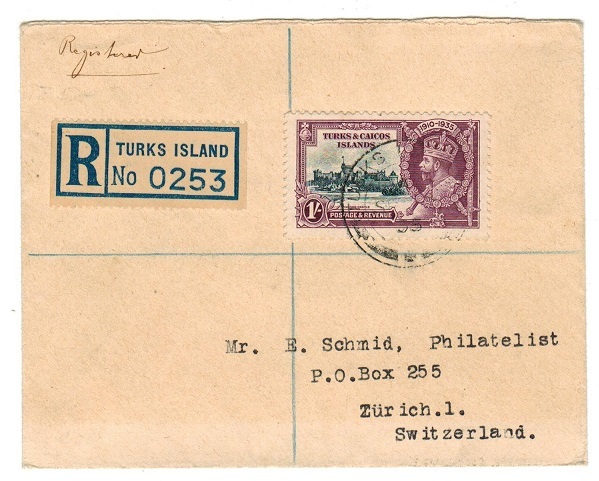 1935 registered cover addressed to Switzerland bearing the 1/- 'Silver Jubilee' adhesive tied by TURKS ISLAND cds. NEW YORK transit and ZURICH arrival b/s. TURKS AND CAICOS IS - 1962 use of 'FORMULA' RPSE to Jamaica. 1962 (JA.31.) 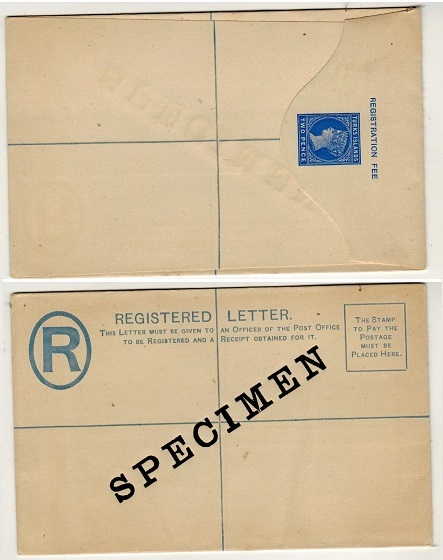 use of blue on cream FORMULA registered postal stationery envelope (size G) bearing QEII 8d and 1/- adhesives tied REGISTERED/TURKS ISLAND cds's. Elusive item. TURKS AND CAICOS IS - 1945 crowned PASSED/ D/43 censor in black on OHMS cover to USA. 1945 (FE.2.) long manilla O.H.M.S. envelope registered to USA bearing 6d and 1/- adhesives tied by GRAND TURK/TURKS ISLAND cds's with black octagonal crowned PASSED/ D/43 censor h/s on front. Miller CM3. 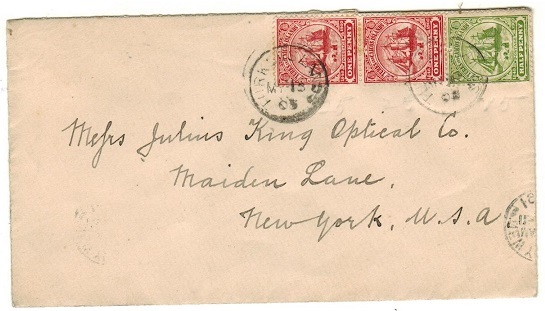 TURKS AND CAICOS IS - 1928 OFFICIAL PAID cds on OHMS cover to USA. 1928 (OC.23.) 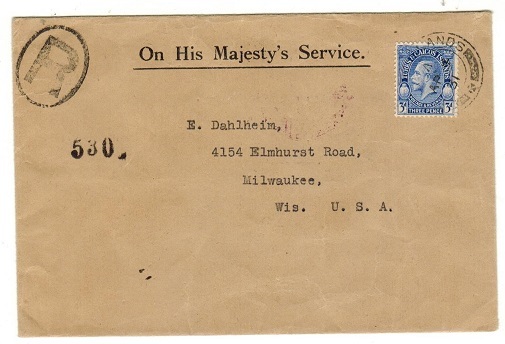 use of long stampless 'On His Majesty's Service' envelope addressed to USA struck by scarce violet oval POSTMASTER/TURKS ISLAND h/s at lower left and cancelled by s/r TURKS & CAICOS ISLANDS/OFFICIAL PAID cancel (Challis type 02) struck in the scarce brown colour. TURKS AND CAICOS IS - 1928 1/2d IMPERFORATE PLATE PROOF in blue. 1928 1/2d IMPERFORATE PLATE PROOF (SG type 45) printed in blue on thin ungummed card. TURKS AND CAICOS IS - 1928 1 1/2d IMPERFORATE PLATE PROOF in blue. 1928 1 1/2d IMPERFORATE PLATE PROOF (SG type 45) printed in blue on thin ungummed card. TURKS AND CAICOS IS - 1928 2d IMPERFORATE PLATE PROOF in blue. 1928 2d IMPERFORATE PLATE PROOF (SG type 45) printed in blue on thin ungummed card. TURKS AND CAICOS IS - 1928 3d IMPERFORATE PLATE PROOF in blue. 1928 3d IMPERFORATE PLATE PROOF (SG type 45) printed in blue on thin ungummed card. 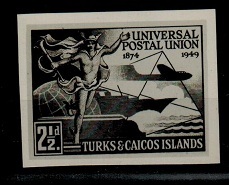 TURKS AND CAICOS IS - 1949 2 1/d 'UPU' IMPERFORATE PHOTOGRAPHIC PROOF. 1949 2 1/2d 'UPU' adhesive in a IMPERFORATE PHOTOGRAPHIC PROOF numbered '1' on reverse. Scarce. TURKS AND CAICOS IS - 1951 cover to UK via SOUTHAMPTON/PAQUEBOT. 1951 (NOV.14) cover to UK bearing 6d & 1/- adhesives tied by PAQUEBOT/POSTED AT SEA/SOUTHEAMPTON PAQUEBOT roller type cancel.